Sir David Attenborough begins Christmas week with the New Zealand robin. Sir David Attenborough begins Christmas week with the New Zealand robin. The toutouwai or New Zealand robin may share a name with the more familiar European robin, but it is a very different bird to the robin redbreast we know so well. 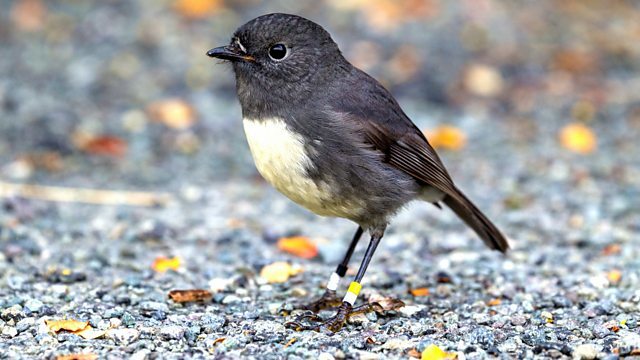 Although about the same size with the same perky upright stance, the New Zealand robin, is appropriately enough nearly all-black, with a pale belly and a white splash just above the bill, but no trace of red. Three subspecies exist; one in north Island, one in South Island, and another in Stewart Island. And like their British counterparts, who they are not closely related to at all, can become quite tame and friendly to humans. The song is very varied and each male has a repertoire of around two dozen different notes. Webpage image courtesy of Brent Stephenson / naturepl.com. This programme contains a wildtrack recording of the New Zealand robin kindly provided by The Macaulay Library at the Cornell Lab of Ornithology; recorded by William V Ward on 18 Dec 1968, at D'urville River, Nelson Lakes National Park, South Island, New Zealand.